Ruin Lust "An ideal of beauty that is alluring exactly because of it's flaws & failures." One of my granite and resin Hewn rings, inspired by the crumbling textures of ageing and weathering in our surroundings. Ruin Lust (from the German concept of appreciating ruins - Ruinelust) is the exhibition at Tate Britain which finished this time last week. Now that it is over (as anything must end to become a good ruin) I will collect the fragments which I left with and assemble them here on my blog. I was very excited to visit this exhibition as this idea of discovering partial remains of a bigger thing and capturing the textures of erosion have long been a big part of my work. But knowing me, I am a curious beast and the look of something has never been enough. I always want to find out the why and how, and these not only form the concepts behind my work but also my experimental processes. I was not disappointed by Ruin Lust, there was a great variety and depth on this cultural phenomenon to explore. The main idea I'd like to take away from the exhibition is that Ruins can be seen as a positive thing. "We were intrigued by the World War II bunkers that were being drawn back into the water," Jane says. "It was like something from an ancient civilization, but darker." I was charmed by this sculpture by David B McFall. Following the Wilson's ruined bunkers this is a remnant from Great Britain's experience of the Second World War.The Portland stone used for this piece was once a part of a London Bank, one of the buildings destroyed in the bombing of Southwark. You can see the original carvings of the 19th Century swags and flowers from its architectural past. This wonderful re-use of debris and the subject of a young Bull Calf is a symbol of new hope and seeing the potential to grow strong and rebuild. You can see why it was chosen for the Royal Academy Summer exhibition in 1942, even when McFall was still a student. Another example of a ruin reused which not part of the exhibition is this unusual sight of St. Benet's Abbey. The ruined abbey is situated on the River Bure within The Broads in Norfolk England. Demolished from the dissolution the gatehouse remained, which is now a grade I listed building. 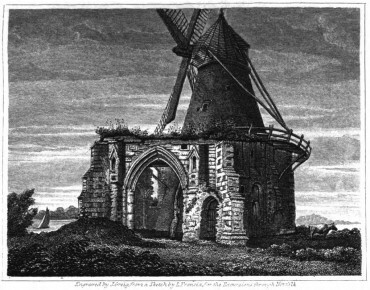 In the second half of the eighteenth century, a farmer built a windmill inside the abbey ruins, (adapted even further to make a wind pump later on), The windmill is now itself a grade II listed building, creating a ruin within a ruin. I enjoy the fact that a ruin leaves space for your imagination. The journey it has gone through to get to that point had affected it and it is up to us to use our minds to investigate, elaborate and furnish the remaining bones. This is what engages us with it and makes our experience a personal discovery rather than being presented with a perfect, pristine place or object, which could literally be a brick wall to creative ideas. These concrete steps look out of place in this surreal image by Paul Nash. Without trying to envisage the lost structure of the demolished building they can be enjoyed as a curious sight in their own right. Like an Escher drawing these impossible stairs let us create an invisible doorway wondering where or when it might lead to, a portal to another time or dimension. It was Fritsch mania at Manchester Gallery the other Thursday night! The exhibition on his exciting jewellery work is running currently at the Gallery on Mosely Street, who's outer façade inner hall and staircase are currently cascading with luscious leafy foliage and blooms to lift your heart in this Narnia March we're having. The curator of this exhibition is Jo Bloxham the driving force for many amazing shows such as The Sting of Passion in 2009, uniting jewellery artists with Pre-Raphaelite paintings to create some remarkable work. aiming to show jewellery as an artform, rather than purely a decorative commodity, something she believes that the U.K is a little behind in. Manchester museum's site reads on The Sting of Passion: "The works portray women as a femme fatale, a seductress, and in some cases, purely as an object of beauty. You can see how this was a perfect union to push preconceptions of jewellery as an artform and show it is much more than something nice to look at, the same as the iconic women depicted in the famous paintings, with equality and the portrayal of women in the media today a continuing topic for debate. 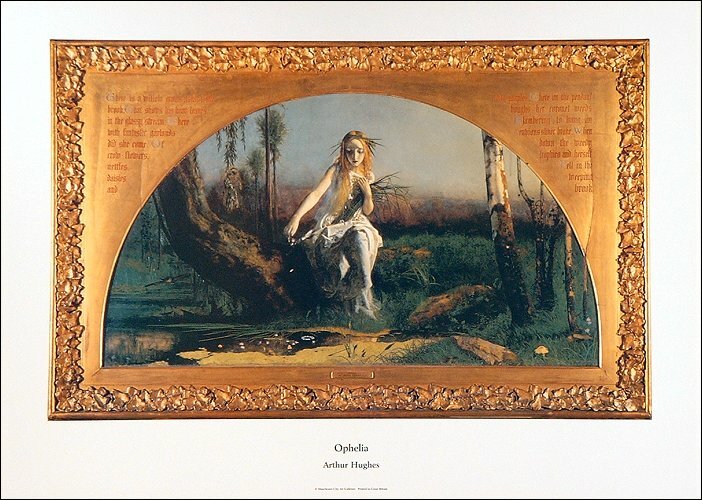 Ophelia, Arthur Hughes part of "The Sting of Passion" exhibition combining Pre-Raphaelite paintings and contemporary jewellery. As Karl dashed across the globe from Germany's Schmuck fest over to New Zealand where he is based he stopped over to talk to us about his work (as part of Manchester gallery's Thursday lates). Often controversial, his approach caused many a "heated discussion" while he was studying under his mentor, and now friend non other than Hermann Junger. When asked about his unconventional ways and his opinion on learning the recognised ways of working in order to be an artist jeweller Fritsch said: "You must take ownership, do it the way you think right. If it is new it will always be a challenge." "Yes, of course the ring wants to be beautiful. The technique also wants to be beautiful, and most often it’s the idea that wants to be the most beautiful. But sometimes a piece likes nothing better than to sit in the mud and not give a damn about how it looks. If it is exactly what it wants to be in a given moment, it is precise, perfect and the most beautiful." 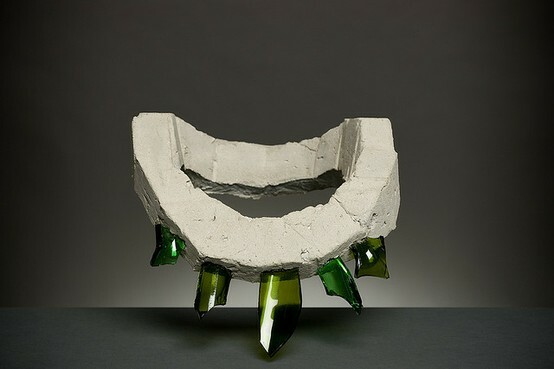 A series of his earlier work he himself describes as intentionally ugly, at a time when he was looking at the concept of wearing jewellery to attract attention and thought that an "unattractive" piece would draw the eye as much as one with a conventionally "pretty" aesthetic. The selection of work on show in this exhibition showcased the diversity of his work, giant sculptural pieces, including dinosaurs and mountains of gems down to simple, pared back oxidised metal work of lines and forms. The museum is also part of the fantastic Own Art scheme allowing the purchase of these pieces with affordable payments trying to make artists work accessible to as many people as possible who may be put off by a one off splurge. There was a live discussion on this subject via the Guardian website last week (read it here). Hopefully this will make art become more attainable and also help artists by selling their pieces without having to water down their ideas or compromise to make a more affordable piece. It is definitely something I am continuing to learn, buying one amazing well made perfect thing you really really want instead of compromising and ending up serial buying inferior things in a bid not to spend too much. Karl Fritsch Screw ring from Unexpected Pleasures at The Design Museum earlier this year. With the hard work of curators, artists and organisations like Manchester Gallery for this show and The Design Museum's Unexpected Pleasures exhibition and Aram's Beautiful Objects already this year hopefully this is something that is transforming before us, so we must do everything we can to encourage it to become the Island for jewels of intellect, intrigue and substance. “Over the last 30 years there has been a movement within the jewellery world which has pushed the boundaries of what is possible to achieve within this practice. This has led to work being produced that has a narrative – a conceptual element to it." "Different rings for different things. It doesn't have to be for every occasion. You might put it on to sit and watch T.V. They are a luxury to be enjoyed." Karl Fritsch when asked about the practicality of some of his pieces. This was my favourite, I love the soft green gold tones and the old fashioned blue and coral coloured cabochons and the playful shape. Not just "glue". SUPERGLUE! As an accomplished silversmith Fritsch combines his technical training and skill with an open mind to realise his ideas. Sometimes simple is best. This ring with it's shiny towers of gold was another of my wish list choices. Whether you know of Karl Fritsch's work or not this a great exhibition to look around as there is such a variety of materials and styles it will get you thinking and discussing your opinions. Guessing each other's favourite, or even psychoanalysing "which ring would represent so-and-so" is a good, fun game as well. I think with wearable objects there is always another level of engagement to enjoy as you automatically imagine wearing it, touching it and how it would interact with your life. Many people may feel more at home "browsing" objects than viewing and critiquing a piece of art, so I hope this kind of exhibition encourages more people into galleries and museums.